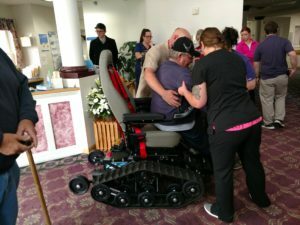 Defender Mobility, a small charitable arm of POAM and TPOAM, is thrilled to gift another Trac Fab chair to a military veteran. The latest chair recipient is Daniel Higgins. Trac Fab chairs are all-terrain electric wheelchairs. They allow individuals who are confined to wheelchairs to go out and explore nature, which is something that isn’t possible with normal electric wheelchairs. Defender Mobility purchases and donates these chairs to veterans like Dan. Dan has quite an impressive military past. He enlisted in November of 1979 into the Air Force. During his time, he served in the 1st Gulf War, Desert Storm, and Desert Shield as Military Police, as well as helped develop the Homeland Security Program. He was one of five military police to train others in radar and self-defense. Dan was always very active until he had a severe stroke in 2014 leaving him paralyzed on his right side and confined to a wheelchair. He struggles daily from his permanent Bell’s palsy, which has left the left side of his face paralyzed. Dan is also struggling with depression and boredom because of his loss of independence. But even though his struggles, he has managed to keep a smile on his face, giving uplifting words of encouragement to staff and other residents, and always has a joke or two when you need it most. He attends physical therapy twice a week and is now getting out to go fishing for his therapy sessions, but being confined to a wheelchair makes that difficult. 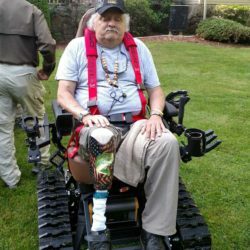 We hope that his new TracFab chair will help him regain some of his independence and get him outdoors again. POAM has also donated an additional TracFab chair to Whispering Pines Senior Living, the facility in which Dan lives. Whispering Pines currently has nine residents and one staff member who has fought for this country. This chair will be able to be used by all residents confined to wheelchairs.